"Less blogging and more snogging" has been my mantra for the last three months as I've taken a short break from the blogosphere and focused more on settling into married life. It's been a gentle and vital time for me and Leigh to do some nesting in our new home and it's also provided space for us to have some big conversations about our plans for the future. As much as this time away from blogging has been an incredible blessing to our relationship it has left me with so much that I simply can't wait to tell you about. My mind is bursting at its seems with beautiful places that I need to share with you and projects I've been planning. It's tempting to do a brain dump in one blog post, but that wouldn't do justice to some of the uniquely special places we've experienced. Speaking of 'uniquely special', I'm entering back into the blogosphere by sharing our mini-moon at the Scarlet Hotel. I was invited to review the Scarlet Hotel, and we couldn't get it organised pre-wedding (AKA the most stressful time of my life). Already aware of how stunning the Scarlet Hotel is we decided to use it as a little post-wedding mini-moon where we would sit down and have a think about where we wanted to go on our honeymoon. I am so glad we did as our two nights there were nothing short of magical. You would never have guessed it from the clear blue skies on display the afternoon we arrived but our stay was in the second week in October. We arrived outside the hotel at three in the afternoon and was greeted by the valet who took our car keys and showed us to a table by the window overlooking the bay. A tray serving herbal tea and biscuits was brought over, and a member of staff came to check us in. 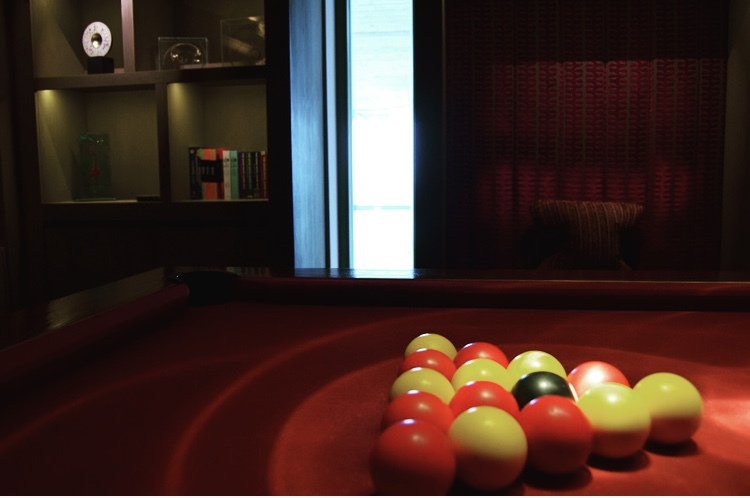 Everything is a little different at The Scarlet Hotel. There's not a check-in desk or reception. Instead, if you walk through the foyer a smiley-faced and eager to assist member of staff suddenly appears out of nowhere to answer all of your queries and meet all of your needs. Like a genie in a bottle, except these guys come out of the walls, or so it seems. It makes the whole hotel feel really relaxed and personal. Like you're staying in someones large and rather wonderful house instead of a hotel. 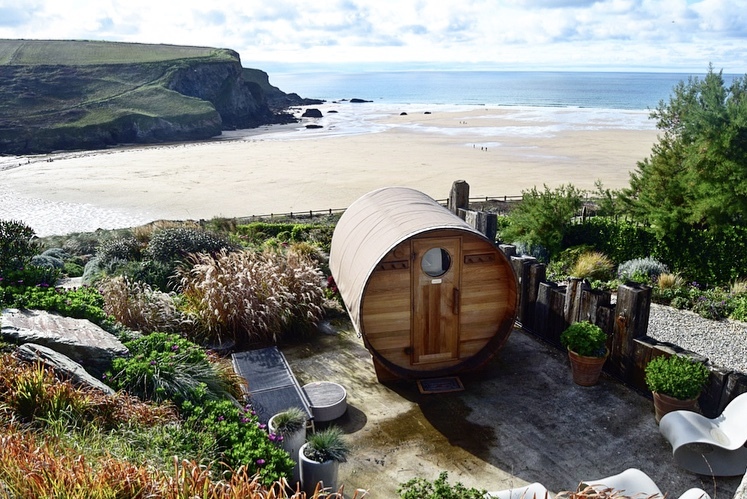 After the hot tub, we made our way down to the chillout pods which are nestled into the cliff top. I dug out my book, convinced my puppy to cuddle into me and read a couple of chapters. Occasionally peering over the top of my book to watch the waves and the birds. I concluded that there isn't a more delightful place to engross yourself in the pages of a new book than here. As the sun began to set, we headed back to our room and napped, showered under the monsoon shower and got ready for dinner. I don't have photos of dinner I'm afraid as 1) the lighting was dimly lit creating an intimate atmosphere. Great for romance, not great for photos and 2) It looked, smelled and tasted so good that we couldn't have delayed our gratification for long enough to get one photo. As big foodies, the food can make or break a holiday for us, so it's always a bit of concern whenever we go somewhere. The Scarlet Hotel did not disappoint. We had a 3-course meal with wine flight. Not only was the food sensational but the sommelier was very knowledgeable which added an extra layer to the meal. We have since ordered a few bottles of the wine we drank on this night and have them stashed at home for special occasions. We waddled back to our room and crashed out in our super-king sized bed. The following day we woke up to a slightly more Autumnal Cornish day. The skies were grey, and a thick sea mist hung in the air making the whole bay look very atmospheric. 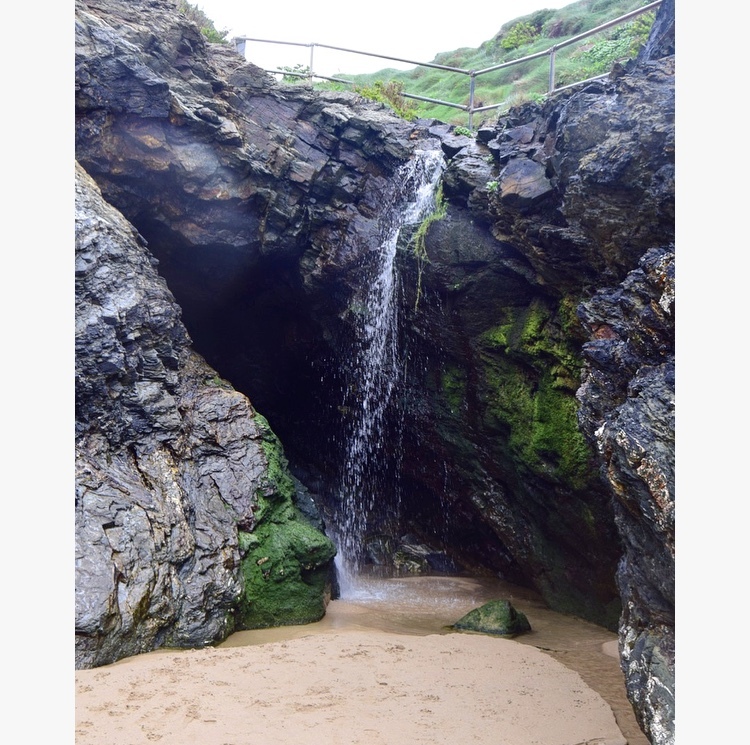 We took Bails (Our dog) for a walk along the beach and explored the caves and rock pools and even found a natural monsoon shower in the form of a waterfall that was pouring off the cliffs. By the time we came back to the hotel, we were hungry and ready to tuck into some more exceptional food. 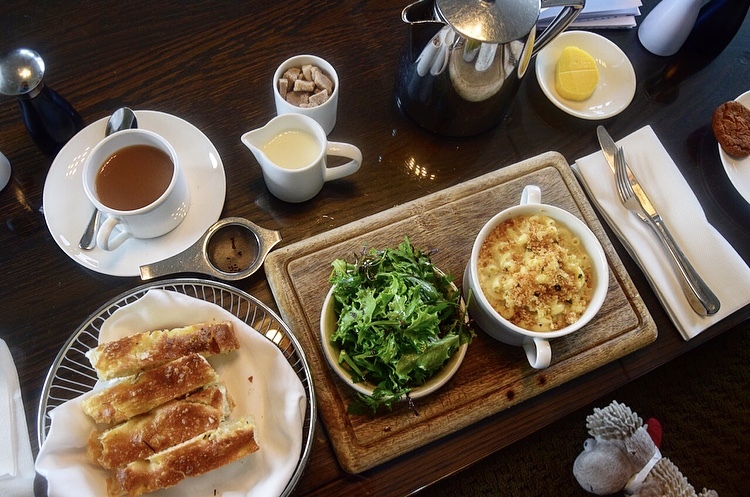 We had lunch on the terrace, Truffle macaroni cheese with warm focaccia and seasonal salad, and then headed back down to the spa. We hung out in the indoor infinity pool for a while and then Leigh bravely entered the outdoor pool. Despite there being others around you really did feel like you had the whole place to yourself. I think the absence of children in the hotel made the place feel so still and quiet that it was easy to forget that other people were also there. Another session in the hot tub, but this time Leigh had a bloody mary and I had an Aperol Spritz. Despite the weather not being as great as the day before, making the photos look pretty dismal, I preferred this day in the hot tub. There's something about being in a hot tub when the air is cold around you, and the wind is swirling furiously. It's how I imagine rabbits and other small furry animals must feel when nestled in their toasty warm holes while there's a storm raging outside. 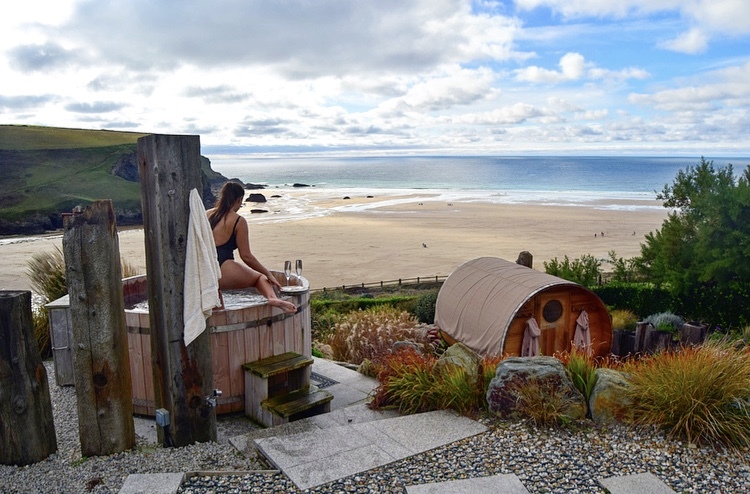 We usually associate the word cosy with being dry, but I'd like to suggest that sitting in one of the Scarlet Hotels hot tubs on top of the cliff, with the brisk Atlantic air on your face is one of the cosiest sensations you can experience. After another afternoon of lounging around in the spa area, reading books, swimming and dipping in and out of consciousness on the reclining chairs. We had another fabulous meal off a different menu in the restaurant. The Scarlet is now our favourite restaurant in Newquay, and we've already booked to go back for our anniversary. 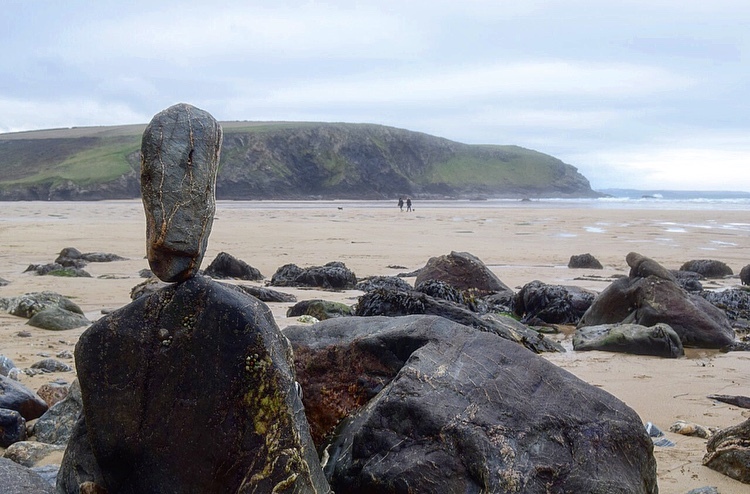 Mawgan Porth has a truly exceptional landscape to explore, and The Scarlet hotel is second to none to host you whilst you explore it. I'd like to thank The Scarlet Hotel for inviting us to stay and for looking after us so intently. It was a wonderful weekend that we'd recommend (and have done already to many of our friends) to anyone else who is looking for an adult escape. We can't wait to visit again.